A unique combination of imaging tools and atomic-level simulations has allowed a team led by the Department of Energy's Oak Ridge National Laboratory to solve a longstanding debate about the properties of a promising material that can harvest energy from light. "We found that people were misguided by the mechanical signal in standard electromechanical measurements, resulting in the misinterpretation of ferroelectricity," said Yongtao Liu of ORNL, whose contribution to the study became a focus of his Ph.D. thesis at the University of Tennessee, Knoxville (UTK). Olga Ovchinnikova, who directed the experiments at ORNL's Center for Nanophase Materials Sciences (CNMS), added, "We used multimodal chemical imaging—scanning probe microscopy combined with mass spectrometry and optical spectroscopy—to show that this material is ferroelastic and how the ferroelasticity drives chemical segregation." 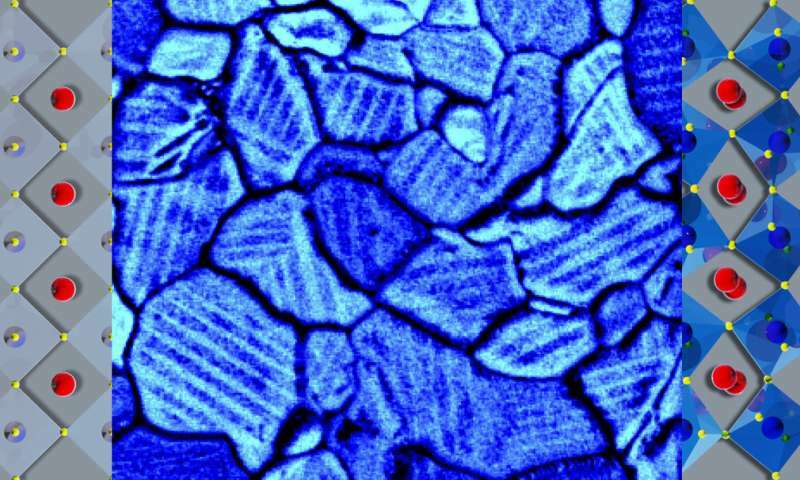 For their experiment, the researchers made a thin film by spin-casting a perovskite on an indium tin oxide-coated glass substrate. This process created the conductive, transparent surface a photovoltaic device would need—but also generated strain. To relieve the strain, tiny ferroelastic domains formed. One type of domain was "grains," which look like what you might see flying over farmland with patches of different crops skewed in relation to one another. Within grains, sub-domains formed, similar to rows of two plant types alternating in a patch of farmland. These adjacent but opposing rows are "twin domains" of segregated chemicals. The technique that scientists previously used to claim the material was ferroelectric was piezoresponse force microscopy ("piezo" means "pressure), in which the tip of an atomic force microscope (AFM) measures a mechanical displacement due to its coupling with electric polarization—namely, electromechanical displacement. "But you're not actually measuring the true displacement of the material," Ovchinnikova warned. "You're measuring the deflection of this whole 'diving board' of the cantilever." Therefore, the researchers used a new measurement technique to separate cantilever dynamics from displacement of the material due to piezoresponse—the Interferometric Displacement Sensor (IDS) option for the Cypher AFM, developed by co-author Roger Proksch, CEO of Oxford Instruments Asylum Research. They found the response in this material is from cantilever dynamics alone and is not a true piezoresponse, proving the material is not ferroelectric.